Andrew Irvin has a broad range of experience throughout North America and Europe. Solo appearances include works by Tchaikovsky, Paganini, Bruch, Vivaldi, Korngold, Bach, Mozart, Sarasate, Ravel and Dvorak. Currently Mr. Irvin lives in Arkansas where he is Concertmaster of the Arkansas Symphony Orchestra. He also enjoys playing in recital from coast to coast with organist David Christopher in the Irvin/Christopher duo. The Camino Trio is another of his chamber music outlets. This trio is made of Kelly Johnson, clarinet, and Gail Novak, pianist. All three musicians are connected by study in Arizona. Look for the Camino Trio on Kelly's CD "Child's Play" out soon. He can also be heard in recording on the Naxos label with the Hot Springs Music Festival. Mr. Irvin served as concertmaster, leader, and soloist of orchestra "Air de Cour," in Rochester, New York. This ensemble received grants from New York's State Legislature and The New York Council for the Arts. Highlights of his chamber music career include performances with the Ying Quartet, the Audubon Quartet, and New York City premiere of composer Steve Mackey's Troubadour Songs. Mr. Irvin made his European debut at the Heidelberg Schlossfestspiele, where he was principal violin in the festival orchestra and was featured on the chamber concert series. 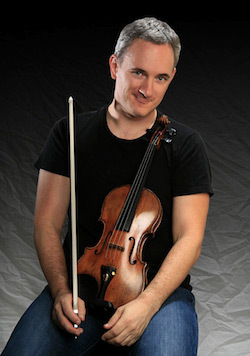 Before moving to Arkansas, he was principal violin in the Arizona Opera Orchestra. He plays a 1765 Gagliano violin.